Harbin, a city of roughly 6,000,000 in northeastern China (and the venue for the celebrated Ice and Snow Sculpture Festival each winter), is experiencing a level of air pollution reminiscent of London’s “Great Smog” in 1952. Although the start of the winter heating season has exacerbated air quality problems in Harbin, where coal-fired plants supply most municipal heat and power, a development-environmental quality dilemma exists across China. There is abundant coal in China, but coal is not clean. Consequently, China's leadership is facing demands for forms of development that are more sustainable than what has been offered for the past thirty years. Coal barges on the Huangpu in Shanghai. North Korea is building its first ski resort but can't get ski lifts due to international sanctions against the regime. The response? An official media outlet stated, "This is an intolerable mockery of the social system and the people of the DPRK and a serious human rights abuse that politicizes sports and discriminates against the Koreans." Nicholas Kristof provides a reminder that, while there is much left to be done in the struggle to eliminate poverty, extreme poverty is declining almost everywhere in the world. As theWorld Bank reported in April, over the course of the thirty years from 1980 to 2010, the proportion of the world’s population living on less than $1.25 a day declined from 1 in 2 to 1 in 5. And there’s reason to believe that the proportion can and will fall even further as disease prevention and development methods that have succeeded in China, India, and across much of sub-Saharan Africa are employed in those areas, many of which have been beset by chronic conflict, that have yet to open fully to aid organizations. This might be an opportune moment to revisit Hans Rosling's impressive presentation of development data for the two centuries beginning in 1810. As he says, "Pretty remarkable, eh?" Today the U.S. Supreme Court gutted the Alien Tort Statute, effectively ending a brief period in the history of American jurisprudence (a mere quarter of a century dating back to the Filartiga case) during which victims of human rights abuse who had no hope of securing justice in their homelands could seek justice in U.S. courts. In the case before the Supreme Court, Kiobel v. Royal Dutch Petroleum, all nine justices agreed that a lawsuit against a multinational oil company for its complicity in the deaths of Nigerian environmental activists should be thrown out. An opinion joined by five of the justices objected to the extraterritorial reach of the ATS in cases like Kiobel, the very feature that has made it an important tool for the promotion of international human rights law. For more on the ruling, see the New York Times story here, an editorial from the same paper here, and the learned counsel of several experts participating in an "insta-symposium" over at Opinio Juris. Lawyers representing Big Oil are no doubt celebrating tonight. 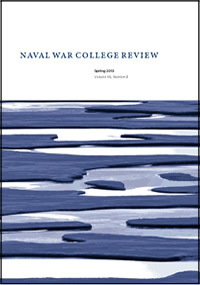 It is a pleasure to note the recent publication of "Race to the North: China's Arctic Strategy and Its Implications" in the Spring 2013 issue of the Naval War College Review. Shiloh Rainwater, a senior Political Science major at Pepperdine, is the author of this important paper analyzing Chinese interests in the Arctic and China's desire to join the Arctic Council. Open water in the Arctic ice cap, in a U.S. Coast Guard image posted on the website of the U.S. Geological Survey. This 2009 image, which the photographer titles Reflections, was taken in August, but open water is appearing in ever-greater expanses of the region and for ever-larger proportions of the year—a fact that has drawn the attention of nations far from the pole. In this issue, Shiloh Rainwater explores the Arctic interests of one important non-Arctic nation, the People’s Republic of China. I am delighted to have served as the thesis advisor for Rainwater on this paper. Congratulations, Shiloh. If you're not worried about cyberattacks--and about the security of the many institutions that now rely on the Internet--you're not paying attention. American Express went offline for two hours yesterday as a result of a cyberattack that experts believe provides evidence that some government-sponsored hackers--current suspicions point toward Iran and North Korea in recent attacks--are interested not in espionage but in destruction. Speaking of similar attacks on South Korean banks last week, the research director of one computer security firm said, "This attack is as much a cyber-rampage as it is a cyberattack." While American Express confirmed that it had come under attack on Thursday, it also said it believed no customer data had been compromised. Earlier this week, Wells Fargo's website was attacked. A day later Wells Fargo customers experienced problems with bank-issued debit cards, but the company said the problems were unrelated. Yesterday the International Criminal Tribunal for the Former Yugoslavia (ICTY) handed down sentences in the cases of two former Bosnian Serb officials convicted of crimes against humanity and war crimes. Mićo Stanišić and Stojan Župljanin were both sentenced to 22 years in prison having been convicted of the following charges: "persecution, a crime against humanity, through the underlying acts of killings; torture, cruel treatment, and inhumane acts; unlawful detention; establishment and perpetuation of inhumane living conditions; forcible transfer and deportation; plunder of property; wanton destruction of towns and villages, including destruction or wilful damage done to institutions dedicated to religion and other cultural buildings; and the imposition and maintenance of restrictive and discriminatory measures." Both men were also convicted of murder and torture, which are classified as war crimes. Župljanin, but not Stanišić, was convicted of extermination as an element in the crimes against humanity. The charges stemmed from the defendants' efforts to establish an ethnically pure Bosnian Serb state (Republika Srpska) following the breakup of Yugoslavia. The resulting conflict in Bosnia, which lasted from March 1992 to December 1995, claimed approximately 150,000 lives. During the war, scenes reminiscent of those in Nazi concentration camps were played out in various locations across Bosnia as a genocidal policy of "ethnic cleansing" was implemented by the Bosnian Serbs and, on occasion, other parties to the conflict. To date, the ICTY has indicted 161 people and has discharged cases involving 136. Sixty-nine people have been convicted of crimes; 18 have been acquitted; 13 have been transferred to other courts for trial; 36 cases have been terminated without a verdict (as, for example, in the case against former Serb president Slobodan Milosevic, who died before the conclusion of his trial) or have had charges withdrawn; and 25 cases are ongoing. The designation of a Dutch web hosting company, Cyberbunker, as a spammer by an informal Internet organization called Spamhaus has touched off a private cyberwar with public consequences thanks to what many regard as a basic flaw in the architecture of the Internet. Beginning on March 19, a distributed denial of service attack (DDoS) began in an effort to shut down Spamhaus and CloudFlare, the Internet security company in Silicon Valley employed by Spamhaus to try to defeat the attack. The attack, however, has affected not only its primary targets but many innocent bystanders as well. One observer compared what was happening to firing a machine gun into a crowd of people surrounding the actual target. The Internet's present architecture requires the existence of publicly accessible DNS servers to route information properly. It also provides few ways to protect these servers against malicious attacks such as the one targeting Spamhaus and CloudFlare. "Ingress filtering"--analyzing incoming traffic to detect spoofing so that requests associated with DDoS attacks can be rejected--is a possibility, but because it involves financial costs to the private companies that maintain the DNS servers, few have responded to the need. Internet access has become a public good that is largely under private control with consequences that some experts believe could be catastrophic. The current cyberwar provides a glimpse of what is to come under the current arrangements. There's a good argument to be made that human rights groups played an important role in bringing about an end to the Communist Party's monopoly on power in Russia. (Aryeh Neier makes the argument in his 2012 book, The International Human Rights Movement: A History.) Unfortunately, Russia's current government is showing no gratitude. Officials from the tax authorities and the general prosecutor's office raided Amnesty International's office in Moscow today. A crew from the government-owned NTV television network arrived at about the same time and, according to a New York Times report, has been trying to gain entrance. The network, according to the Times, "is known for producing salacious reports about critics of the Russian government." The Moscow office of Memorial, a Russian human rights organization, was raided last week. Memorial was also targeted by a police raid in St. Petersburg in 2008 that resulted in the removal of twelve computer hard drives containing the organization's digital archives. The People's Republic of China has an image problem. George Washington University professor David Shambaugh explains the problem and suggests ways Xi Jinping and his new foreign policy team could remedy it in this New York Times op-ed today. Brother Number 3, Ieng Sary, has died in Phnom Penh at age 87 while standing trial for genocide, crimes against humanity, and war crimes committed as part of the Cambodian genocide from 1975 to 1979. His case in the mixed UN-Cambodian tribunal called the Extraordinary Chambers in the Courts of Cambodia (ECCC), designated Case 002, will continue with his co-defendants, Nuon Chea and Khieu Samphan. Ieng's wife, Ieng Thirith, was also a co-defendant in the case before her dismissal due to advancing dementia. Ieng was a co-founder of the Khmer Rouge along with his brother-in-law (and Brother Number 1), Pol Pot. He served as foreign minister during the Communists' genocidal rule in Cambodia, a period in which approximately 1.7 million people died from executions, starvation, and forced labor as the Khmer Rouge attempted to return Cambodia to "Year Zero." Ieng persuaded many educated Cambodians who had left the country to return to help rebuild it; most were subsequently imprisoned, tortured, and killed. Ieng's death before the conclusion of his trial has highlighted one of the most significant problems with the ECCC. The long delay in its creation coupled with its very slow pace of operation has severely limited its ability to prosecute those who were most responsible for the destruction of Cambodia in the 1970s. Pol Pot died of natural causes in 1998, well before the tribunal began its operations in 2006. To date, the ECCC has spent $175.3 million and has completed one trial, that of Kaing Guek Eav ("Comrade Duch"), who was in charge of the notorious Tuol Sleng prison in Phnom Penh. Two other cases--Case 003 against Meas Mut and Sou Met and Case 004 against Im Chaem (a Buddhist monk now)--are ready for trial but are mired in political controversy. The government of Hun Sen, who has ruled Cambodia as prime minister since 1985, has numerous links to the Khmer Rouge terror that it prefers not to have revisited through trial testimony. Hun Sen has said that he will block future indictments. As for the conduct of negotiations, we make the modest proposal that the negotiation rooms should in future be an inebriation-free zone. While my government is truly grateful for the strategic opportunities presented by some recent practices, let's save the champagne for toasting the successful end of the session, and do some credit to the Fifth Committee's reputation in the process. This is not something one hears often from diplomats. For more, see this piece by Colum Lynch in Foreign Policy and this New York Times article. There is probably no organization that has done more to disentangle American Protestantism from its unholy alliance with the Republican Party than the Sojourners Community founded in the 1970s by Jim Wallis. Social justice has been the touchstone of the organization and its widely read publications including Sojourners magazine and the God's Politics blog. Today the blog features a story by Pepperdine alumna Deborah Whang. "Justice Starts with Empowering Women in the Developing World" addresses issues that Deborah has been passionate about at least since her days as an undergraduate. It's an interesting and compelling piece--and well worth reading, especially with International Women's Day coming up later this week. Coming soon to this space is a link to a new paper titled "Arts and Letters, War and Peace: What Painters and Poets Can Teach Us about International Politics." The BBC's Michael Buchanan provides a tour of the International Criminal Tribunal for the Former Yugoslavia in this video. Stops on the brief tour include a courtroom, holding cells on the floor below the courtrooms, and a wing of the prison in Scheveningen. Ward Wilson of the Monterey Institute of International Studies has an op-ed in today's New York Times arguing that continuing support for nuclear weapons in the United States and abroad is based on five unsubstantiated beliefs about their utility and their inevitability. These myths, Wilson asserts, have formed a major obstacle to the objective of abolishing nuclear weapons. Wilson's book on the subject, Five Myths about Nuclear Weapons, has just been released by Houghton Mifflin. Last spring, the computer security company Kaspersky Lab announced its discovery of the Flame malware--an extremely sophisticated cyber weapon infecting computers in the Middle East but apparently directed specifically at Iran. Flame followed Duqu and its predecessor, an extraordinarily complex worm from 2010 called Stuxnet. The target? Industrial systems running control software designed by the German company Siemens--particularly those controlling centrifuges in Iranian nuclear processing plants. The target of the Stuxnet malware alone strongly hinted that the U.S. government was behind the cyber attack (perhaps in cooperation with Israel), but last June David Sanger reported more definitively in the New York Times that Stuxnet was part of a U.S. program called Olympic Games designed to disrupt the Iranian nuclear weapons program. Sanger, noting that Iran had announced the creation of a cyber force within its military in 2011, added that "there has been scant evidence that it has begun to strike back." Abundant evidence of retaliatory strikes is now at hand. The New York Times is reporting today that cyber security experts believe Iran is behind a series of denial of service attacks against U.S. banks over the past several weeks. Unlike previous distributed denial of service (DDoS) attacks, the recent efforts to crash bank websites have used clouds of networked computers rather than networks of individually infected computers forming a botnet. This has allowed for larger and more sophisticated DDoS attacks than in previous cases; it has also made tracing the attacks more difficult. The malware being employed is called "Itsoknoproblembro" and the technique of using cloud-based systems to attack websites has prompted cyber security experts to coin the term "bRobot" to refer to a compromised network. A group called Izz ad-Din al-Qassam Cyber Fighters has claimed responsibility for the attacks, but the Times says that, according to U.S. intelligence officials, the group is a front for the Iranian government. It is difficult to say what precisely qualifies as a cyberwar and, furthermore, would be very dubious to assert that this is the first one. Regardless, it seems clear that, at a minimum, the U.S. and Iran are now skirmishing in cyberspace.